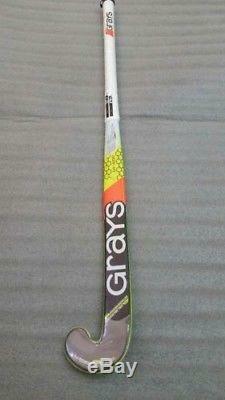 Grays Gr11000 Probow Hockey stick. The Graphene offers unique combination of powerful energy transfer & shock absorbing properties. The Probow blade profile is ideal for drag flicking & 3D skills plus the Octagonal handle construction improves grip and skills. Advanced formulation of impact-resistant materials helps improve the longevity of the backhand edge. Lightweight high-performance foam wrapped moulded handle to dampen shockwaves. Pro Dampening handle - A lightweight high-performance foam is moulded around the handle to efficiently dissipate shockwaves. Improved feel area - A special combination of shock-absorbing aramid and fibreglass softens thefirst touch of the ball, while a textured surface helps grip the ball. Pro Edge Protection: An advanced formulation of impact-resistant materials and resin formulation, to help improve the longevity of the backhand edge. Size:36.5" 37.5". 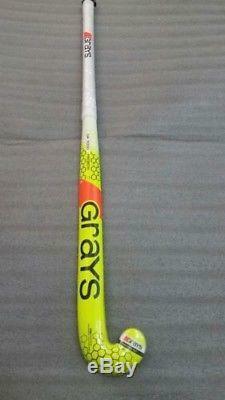 The item "GRAYS GR11000 PROBOW 2017 MODEL FIELD HOCKEY STICK SIZE 36.5L 37.5L" is in sale since Saturday, May 19, 2018. This item is in the category "Sporting Goods\Team Sports\Field Hockey".